Update: Target appears to now be marking certain items as shipping free only with $25 purchases, even for REDCard customers. Despite these changes, I still believe the best part about the REDCard is that it keeps you out of Target. That fact, plus the 5% discount, means it continues to be one of my most vital assets as a homeschooling mom of 4. If you’ve ever set foot in Target, you’ve heard this line at the checkout. Most of us are so used to hearing it, that we don’t give it a second thought. And if you already have existing store credit cards, you probably decline the offer…again and again and again. After all, 5% doesn’t sound like all that much. Most people decline after the first sentence, cutting the cashier off before he can list all the other card benefits. This line hit me during my extreme couponing days, when every tiny percentage saved sounded like a big deal. I also happened to live directly behind Target at the time. We had one car (which my husband used for work), I had a new baby, and Target was a 3 minute walk. Where do you think I spent a LOT of time that cold New England winter? When the cashier asked me if I wanted to open a REDCard and save 5%, I had already heard the line hundreds of times. On impulse, I decided to give it a try. So I handed over my information and walked away the excited owner of a Target REDCard (the credit card…read on for information about the debit card option). I certainly used my Target REDCard…I used it the way Target wanted me to use it. I definitely didn’t have a strategy or a plan. In those early days, the card roped me in like any other credit card does. Studies show over and over that credit cards increase spending by as much as 20% compared to cash purchases. I’d like to believe that I am immune to this statistic, but let’s be real: it’s Target. I quickly realized that my spending was outpacing my budget. The clearance end caps would especially get me. “It’s such a good deal! I can’t pass it up,” I’d reason. My jaw would drop when the bill came. How could I have possibly spent so much?! It was only a few extra items, and I had been saving so much! Yikes. I would pay the bill, but the cycle continued. I’d stock up on diapers, and toss in the clearance pair of shoes my daughter didn’t really need. An extra snack, a new bag, some throw pillows. Gasp – big bill again! Not surprising when you visit every other day. Thankfully, we moved away from Target a couple years later. By away, I mean, a few miles. But hey, increasing your distance from Target by any amount is a good deterrent, right? Adding a couple more kids also hampered my ability to get to Target regularly, which definitely helped keep my spending in check. 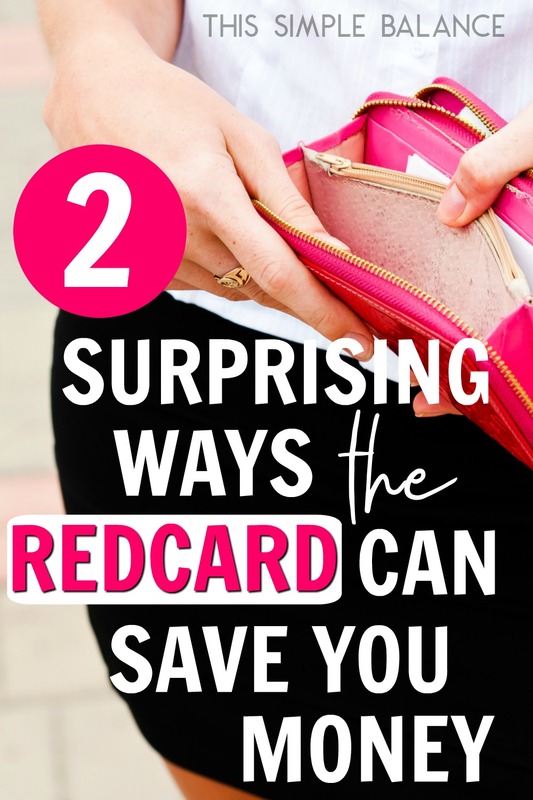 It wasn’t until I was pregnant with my fourth child (and going ANYWHERE to do ANYTHING was so not worth the additional effort) that I finally discovered the hidden benefits of the REDCard and learned how to maximize them. You read that right. What many people miss when the Target cashier is giving you the REDCard speal is that you can use it at Target.com to get free shipping on your purchases. Granted, the free shipping is the standard shipping speed. However, I have found the estimated delivery dates to be way off. I consistently receive packages as much as 4-5 days in advance of the date listed on my shipping updates. The key here is ANY amount. I can buy a pack of straws for $1 and have them delivered to my door for free. Forgot dishwasher detergent? REDCard to the rescue! How sweet is that?! And unlike Amazon Prime, it’s free. I unapologetically share with everyone I know how much I love my REDCard. But how does this solve the aforementioned problem of overspending, you ask? Well, here’s my little secret, the one Target probably doesn’t want added to the list of Target REDCard benefits, and this is key. 2) The REDCard keeps me OUT of Target. Yes, you heard right. I love my REDCard because it keeps me OUT of Target. Using the REDCard properly actually helps me to live a simple, minimalistic lifestyle. Here’s the thing: when I shop ONLINE at Target.com, I typically have a specific purpose. Target’s website is actually pretty poorly designed for searching for the very things they get people to buy in the store. I’ve tried browsing throw pillows, baskets and bins, any kind of home decor, and oh my goodness is it frustrating. I leave in .2 seconds. I rarely can find what I am looking for, and it is definitely not the same as leisurely browsing the aisles, where I end up convinced I need the $80 end table (c’mon! $5 at a yard sale!). Online? I can easily pass it up. In store? Pulling away is DIFFICULT. Back to the secret of the REDCard: I use it almost exclusively online to order specific items. I rarely end up with anything not on my list, which keeps my spending in check. I can stick to my budget. All the In-Store Savings: Are they really worth it? I used to think going into the store was worth it. Between the Target Cartwheel app, coupons, and those enticing gift card deals, the potential savings is huge! But just like everyone else, I am susceptible to impulse buys. It’s why they put the milk at the back of the store, people. You are SO much more likely to buy something else you see along the way. I found that when I tried to save, I would end up spending SO much more. So I now use my REDCard online almost exclusively. I experience the amazing benefits of free shipping, saving 5%, and avoid Target impulse buys all at the same time. Winning! Most people assume that the Target REDCard is ONLY a credit card. Well, it’s not. There are two options when you sign up for a REDCard, and the second one is not offered unless you specifically ask for it. The second option is the debit version of the Target REDCard. The card deducts your purchase directly from your checking account, just like your debit bank card. You still save 5% and get free shipping, and you avoid signing up for yet another credit card. So if staying credit card free is your thing, you can still benefit from the Target REDCard by choosing the debit option. Click here to start saving money, time, and energy today – no credit card required! Do you have a REDCard? Do you think it’s worth it? Next Post: Can you be a one-car family in the suburbs? Here’s how we make it work.